Heading into Spring Training, here’s a look at projected wins, as well as how the playoffs might play out, and the WAR projections used to determine them. And at last we turn our final analysis of a UBA division, the Aaron West. The AW is currently projected to have three teams play .500 ball or better in the ’95 season. Full disclosure: UBA Today! is wholly owned by the GM of the Portland Beavers. And so while we can tell you that the Beavers are our pick to win the division in ’95 (with a very strong challenge by the Grizzlies and a moderate one from the Pranksters), we won’t be handing out a letter grade to that organization. Instead, we’ll present a brief interview with the GM covering his reflections of Portland’s draft below our division grades below. All eyes are on the Aaron Central, where in a move that brings up fond memories of Bud Selig and his Brewers, the United Baseball Association’s commissioner has been hired on as the General Manager of the New Orleans Voodoo (dark magic, indeed). While conspiracy theorists may chuckle, UBA Today! is picking the Voodoo as the Central division favorites. Their path to victory, however, is far from secure, as all three challengers have built teams that project to play around .500 ball, and could rise to contention if the pieces fall in their favor. 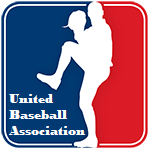 This week, we turn our attention to the Aaron Conference of the United Baseball Association, which some in the press have already tagged the “JC” or Junior Conference, because of the younger age of draftees and the fewer number of teams that clearly look set to make serious playoff runs in 1995. Once again, we begin our review with the East, followed by the Central and then the West. Out West, the Ruth Conference has its toughest division with all four teams ready to make an immediate run in the standings. In Hollywood and Phoenix we possibly have the top two offenses in all of baseball, while further north both Seattle and Irvine have taken a balanced approach, putting together solid all-around teams with players just entering their prime years. According to our spreadsheets, Hollywood is on pace to win the most games, but Irvine and Phoenix are right behind the Stars. Given how tough it will be for the Stars to put together a decent rotation at this stage of the draft, we aren’t prepared to give them the division and will withhold our formal prediction until later in the draft. In the Central, the Toledo Troutheads and Eden Prairie Landsharks will enter 1995 as the division favorites, with Toledo as our current slight favorite for division champ due to five veteran hitters all capable of putting up an .800 or better OPS. The Landsharks, however, put together a strong present-day team that could easily end up taking the division in 1995, while picking up more youth than the Troutheads, and thus get our highest grade in this division. This division houses a lot of power hitters, and fans should be treated to a ton of home-runs. To the relief of fans around the world, baseball is emerging from the ashes of the collapsed MLB. In seven rounds of an inaugural draft, the 24 newly hired GMs of the United Baseball Association have already put together their team cores, pulling in most of the top major league talent. In the following special editions of UBA TODAY, we will grade each team in the Ruth Conference on their picks, and make division-by-division predictions of success for the summer of ’95 and beyond. We will begin today with the East, followed by the Central and the West. The Ruth Conference is already shaping up to be the more competitive of the two UBA conferences, with top hitting and pitching talent settling into new teams. The average new Ruthian is a full year older than the average Aaroner, and a number of Ruth clubs are clearly looking to compete for the inaugural championship trophy this year. The Old Bridge Titans and the Charleston Rebels are emerging as the top clubs in the East, primarily picking up established veterans. The Titans are our current pick for the division champ.